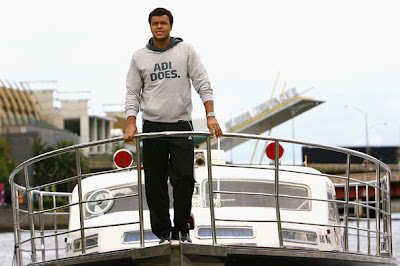 AO 2012: Jo-Wilfried Tsonga "In A Pretty Good Shape"
A morning of inclement Melbourne weather couldn’t dampen the mood of Frenchman Jo-Wilfried Tsonga as he took to the Yarra River on Friday. Despite overcast skies and blustery winds, the smiling Frenchman looked right at home while checking out the city sights from the bow of one of the city’s many water taxis. “I like [to] spend a lot of time on water, I like [to] swim, I like fishing also,” he said. A crowd favourite at Melbourne Park for his cool demeanour and free-wheeling style, Tsonga is about to enter his fifth Australian Open. However, the sixth-seed faces a tough initiation to the 2012 tournament with an opening round clash against the 67th-ranked Denis Istomin. Even though he holds a 2-0 career record over the Uzbekistani, Tsonga expects the first round battle with an in-form Istomin – who has reached the quarterfinals at Brisbane and the semifinals at Sydney this season – to be far from easy. “He’s playing well for the moment. It’s going to be a tough first round but, you know, I’m in a pretty good shape,” Tsonga said. That “pretty good shape” has already seen him net a 2012 ATP title in Doha, courtesy of a 7-5 6-3 win over countryman Gael Monfils in the final. Tsonga, nicknamed Ali for his resemblance to the legendary boxing icon Muhammed Ali, will be hoping to pack a similar punch when the Australian Open begins on January 16. His aim will be to go one win better than his previous best result, which occurred in 2008 when he reached the final before falling to current world No.1 Novak Djokovic. “I feel great, I’ve had some great moments [at the Australian Open] in 2008, 2009, 2010, 2011,” he recalled. “[I] hope I will play a good tournament. When he’s not lining up his trademark forehand drive on court, Tsonga plans to use his down-time to check out some of the many restaurants scattered throughout Melbourne’s CBD. And when asked about what he liked to do most outside of tennis – the likeable Tsonga revealed a simple, but perhaps not surprising, answer. “I like to laugh, I like to laugh a lot. I think for me it’s the best medicine,” he grinned. Heading in to the first major of the year, a relaxed, care-free and well-fed Tsonga can only bode well for his aspirations of winning a Grand Slam tournament.